Mr Blue Sky wrote: Anyone who expected this to look exactly like the renders was kidding themselves. Cardiff will look better from a distance but these towers will not add much to our city’s architectural legacy at street level. To be honest, I have little time for this forum these days as I have better things to do with my time that to feed certain trolls. Just glancing at some the recent pages has not made me miss the place. Yes, there is a difference from the renders, but I still quite like the way the building is shaping up. Whilst it may not be to everyone's taste, I think it is miles ahead in terms of quality from many other projects in Cardiff and I do hope that other people can at least appreciate that and the work that many local people have put into this building. I actually like the way the building is shaping up. At least for me, it looks miles ahead better than the Motorpoint, Big Sleep etc. I'm looking forward for more of the cladding to appear on the main structure. Has this now reached the 27th floor? Eh, It doesn't look anything like the renders which isn't great, however, I have no problems with the building at this stage, and I think the main tower will look good in the white cladding. I'll reserve my judgement until it is finished, however. I too think it's going to end up looking nice enough, but I don't think that makes any difference to the problem of the inaccurate renders. Cardiff Council should certainly make sure they get a clear explanation for the change as well as at what stage the changes were made but I'd like to see a hefty penalty imposed on Watkins Jones to send a message that this isn't acceptable. Frankly it's hard to see how it's anything other than blatant dishonesty from the developers and just because the end result of it isn't too bad this time is no reason to let it slide. During the planning process the council would of received samples of the cladding in question there for they would of signed off on the cladding in question. I think you've just described the problem quite nicely. Yeah, what DaiB said - you've just described the problem perfectly. If the cladding isnt what was shown in the renders, why the hell would the councillors sign it off as acceptable to use? Makes the problem sound even worse, actually. 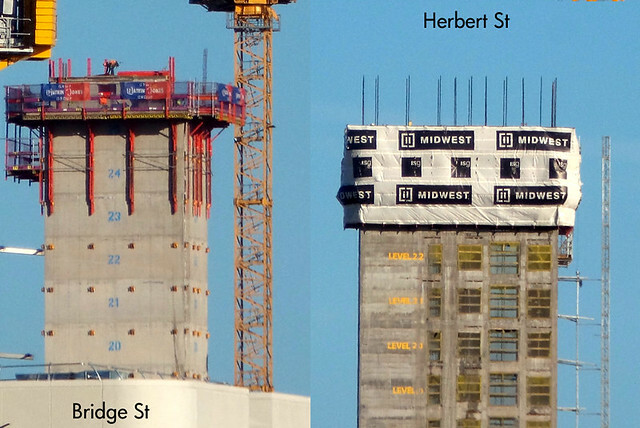 So the Bridge Street tower has reached max height whereas herbert st still has 2 or 3 floors to go - I'm sure we'll know next week.